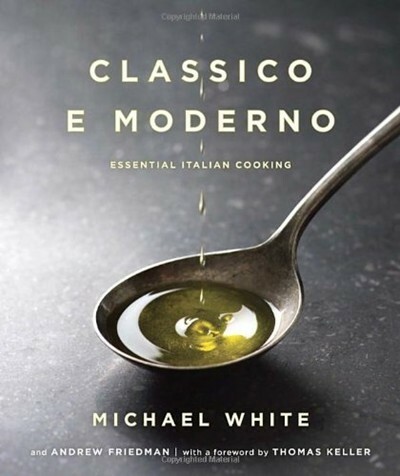 Having won or been nominated for just about every known prestigious culinary award, Michael White is hailed by food critics as the next great hero of Italian gastronomy. His reach extends around the globe with a clutch of acclaimed fine dining restaurants, including Marea, Ai Fiori, Osteria Morini, and pizzeria Nicoletta. Now, in Classico e Moderno, White brings his passion for authentic Italian cuisine to the home kitchen, with recipes—nearly 250—that cover both the traditional and contemporary dishes of the region. In the “Classico” portion, White shares such iconic dishes as Meatballs Braised in Tomato Sauce; Pasta and Bean Soup; Cavatelli with Lamb Ragù and Bell Peppers; and Roasted Pork Leg with Rosemary and Black Pepper. The “Moderno” chapters feature recipes that have put White’s restaurants on the map, including Chicken Liver Crostini with Marsala-Braised Onions; Fusili with Red Wine–Braised Octopus and Bone Marrow; and Veal Chops with Roasted Endive and Pancetta Cream Sauce. Both the Classico and Moderno sections offer ideas for your whole meal: first courses (Vitello Tonnato, Garganelli with Caviar Cream ), soups (Zuppa di Baccalá, White Bean Soup with Sautéed Shrimp), pastas (Tortellini alla Panna, Ricotta and Swiss Chard Tortelli), main courses (Pollo alla Diavola, Braised Lamb Shanks with Farrotto), and desserts (Crostata di Ricotta, Panna Cotta with Meyer Lemon–Basil Sorbet and Almond Milk Froth), as well as salads, pizzas, and basic formulas for pesto, stocks, and vinaigrettes. Including personal notes and anecdotes about White’s early sojourn in Italy and his flavorful career, Classico e Moderno will give you all the tools, tips, and tricks you need to cook tantalizing Italian dishes with the confidence of a seasoned chef.